How many times have you said something and later regretted it? We all know the pain of regretting words we have spoken. We can restore bruised relationships through repentance and forgiveness, but spoken words can never be retrieved. We need to learn to bridle and control our tongue. When we put a bridle on a horse, is it tamed immediately? No. Just as it takes time to tame a horse, it takes time to tame our tongue. Last week, we learned that the tongue is only divinely tameable, meaning only God can tame our tongue. Does this mean we are then not responsible for the words we say? Or does it mean we need to cooperate with God? Our responsibility is to bridle the tongue. Although the tongue is humanly untameable, this doesn’t mean we have no responsibility. Just like salvation, where God does the work, we are still told to repent, confess, and put our trust in Jesus. When a bridle is put on a horse, it is uncomfortable, and takes time for the horse to get used to it! Just the same, as we begin to collaborate with God, we will fail sometimes. Our responsibility is to not give up at our first trial. If we are going to be slow to anger, we must be slow to speak. Think of the acronym W.A.I.T. — Why Am I Talking. “The tongue can bring death or life; those who love to talk will reap the consequences” (Proverbs 18:21). If this is the case, why do we speak without thinking about the effect our words will have? Remember, it is our responsibility to restrain our lips. God tames the tongue, but we have to work with God to bridle our words. Think about what you’re going to say before you answer! How many times have we said something and later said, “I wish I’d thought that through”? There are generally 3 types of people in the world: Those who think before they talk, those who think while they talk, and those who think after they talk. We all need to master thinking before we talk. Ask yourself what you should say, and how you should say it. Just take a moment and ponder. Surrender your tongue to the Lord daily. You face new circumstances and new conversations every day. Regularly acknowledging your need for discernment and God’s grace helps you remain conscious of your words. Let your mind be filled with God’s word. “All Scripture is inspired by God and is useful to teach us what is true and to make us realize what is wrong in our lives. It corrects us when we are wrong and teaches us to do what is right. 17 God uses it to prepare and equip his people to do every good work” (2 Tim. 3:16-17). When the thoughts of your heart are focused on what is good and true, your words will reflect it, bringing honour to God and to others. Pray and rely on God’s strength. With human efforts alone, no one can tame their tongue. Only by the grace of God in your life can you seek to control your speech. There is an interesting event in Isaiah’s life, when he met the Lord as a young man. Read Isaiah 6:1-8. What is the first thing that comes to Isaiah’s mind when he says, “I have seen the Lord”? It is his mouth! Isaiah has an encounter with God. He could not control his tongue. God cleansed him, and then he was able to go in the name of the Lord. 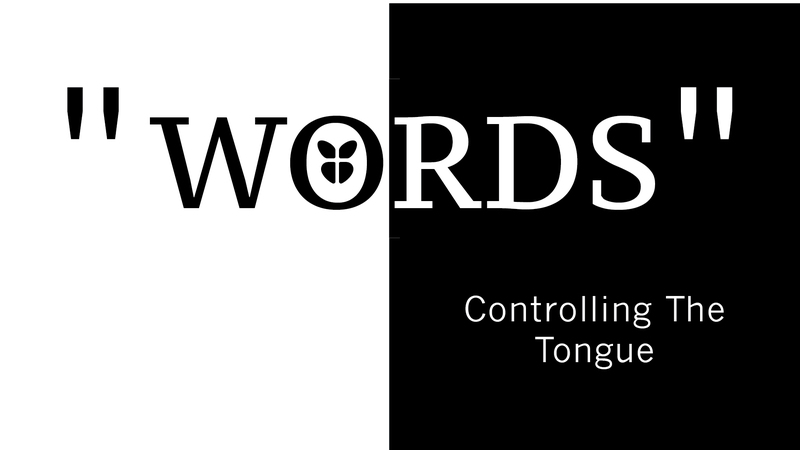 Let the Holy Spirit help you control your tongue. Surrender your life completely to God.